The Ford Flex is a popular SUV offering a blend of style, comfort, and durability. This trend-setting midsize vehicle can help you meet the demands of the roads while safely transporting three rows of passengers. Ergonomic instruments and controls put you in control. 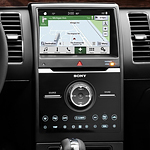 Every component of the new Flex instrument panel is easy to read and easy to reach. Such convenience helps you remain safe as you focus your attention on the road ahead. Three rows of seating permit maximum flexibility for hauling important people and cargo. A mix of bucket and split bench seats provide options for passengers. Folding second and third-row seats optimize storage space. We at North Central Ford would be pleased to provide you with the opportunity to test drive a Ford SUV. Once you feel the difference premium comfort features can make, the Ford Flex may very well be your next family vehicle.